with digital control drive mechanism. Juki DDL9000C series industrial sewing machine with direct drive motor, automatic thread trimmer and newly developed digital adjustment control with LCD display. Model DL-9000CS (DDL9000CSMS digital type with semi-dry lubrication) features programmable digital adjustment of the feed dog height, feed pitch and feed motion. The Juki model DDL-9000CF (DDL9000CFMS full digital type with semi-dry lubrication) also adds digital adjustment to the presser foot pressure, sewing thread tension device and a 4.3-inch large LCD touch screen operation panel. These programmable adjustments can be set and recalled when switching between different garments and materials types; doing away with the constant manual adjustments each time you change back to a style you have done in the past. DDL-8700-7 Juki DDL-8700-7 Single needle UBT lockstitch sewing machine with automatic thread trimmer & stitch program. New Model DDL-900B Juki DDL-900B Single needle UBT. Direct drive model with old shielding system. DDL-9000B Juki DDL-9000B Single needle UBT lockstitch sewing machine with Direct Drive ,automatic thread trimmer & stitch program. 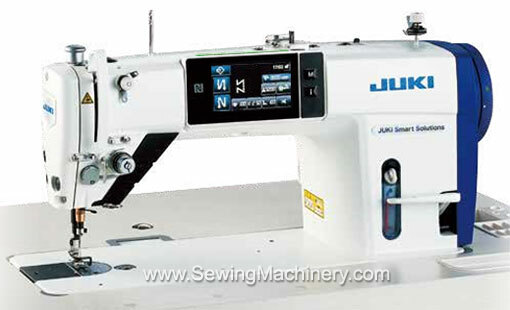 Juki DU-1181N Juki top & bottom feed sewing machine with large horizontal axis hook. Juki DDL-8100e economy single needle lockstitch sewing machine.